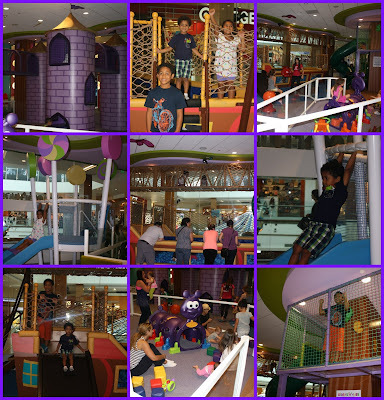 Westfield Topanga recently welcomed another new addition to it's directory of fun. 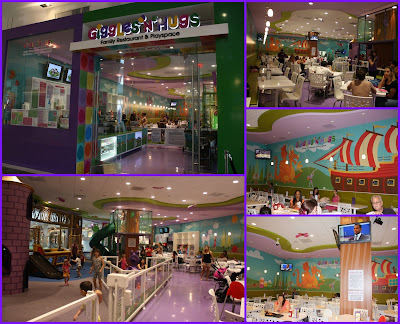 Giggles N' Hugs Family Restaurant & Playspace is the first restaurant to bring new meaning to the words "indoor playground". 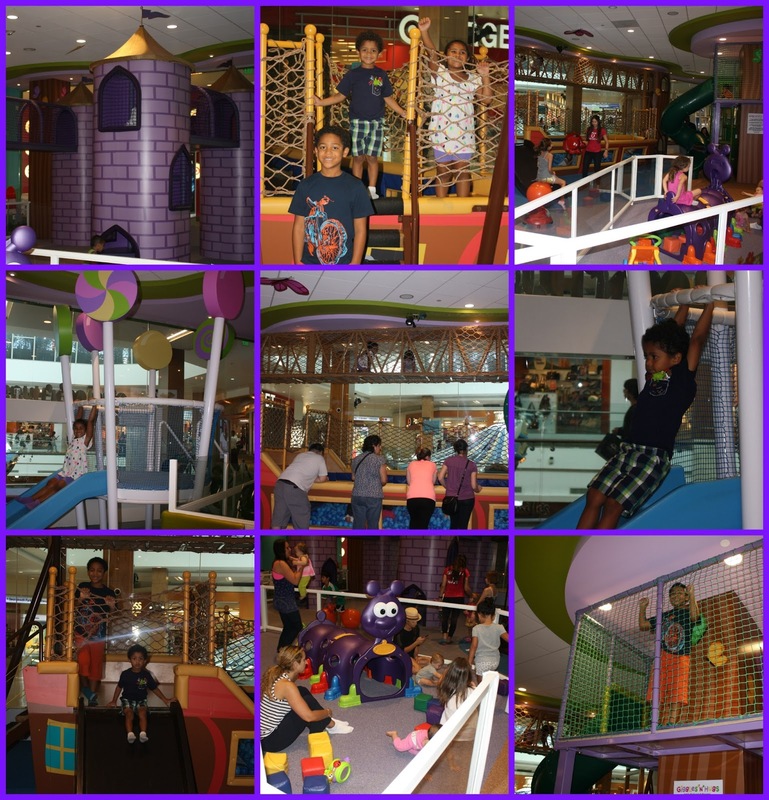 I am sure most of you are familiar with indoor play centers. The kids love them, but there are very few food options available. Most play centers offer dry snacks and juice boxes. Some might have a concession area with chicken nuggets and frozen pizza. Giggles N' Hugs is an actual restaurant! A real sit down, full menu, casual dining type of place where your children can run free and play while you order an appetizer or a yummy dessert! The playground is amazing! There are so many different fun features for the kids to enjoy. The two largest structures are the Princess Castle and the Pirate Ship. My kids had a blast playing in both. Your kids can enter the Princess Castle then climb across rope tunnels and exit on the Pirate Ship. The Pirate Ship has a shallow ball pit with a deck and slides. There is also a zip-line that crosses over the top of the Pirate Ship that is used twice a day with the assistance of a Giggles N' Hugs staff member. There is also an adorable lollipop slide that my daughter loved and a tree house. The toddler area is perfect for your little tykes to explore and tumble in. Then my oldest discovered the video games! That just sealed the deal for my boys. 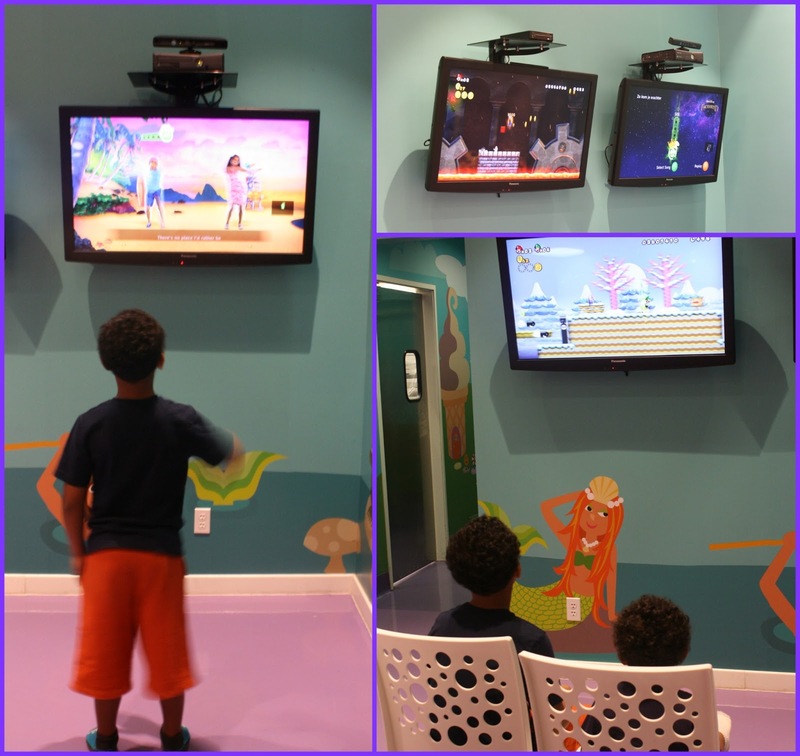 Giggles N' Hugs offers the Nintendo Wii and XBOX Kinect for little gamers to play while they wait for their lunch. All of this fun wouldn't mean a handful of beans if Giggles N' Hugs didn't deliver a great team of employees with the patience of saints and smiles for days! We had the chance to hang out with Carlos who has been working for the Topanga location since the first day it opened for business. He is so proud to a part of the Giggles N' Hugs team and let me tell you...this guy knows every single item on the menu like the back of his hand. He told me which dishes were his favorites, what ingredients were used, gluten-free options, vegetarian dishes and so much more! I'll be following up this post with another Giggles N' Hugs post focusing solely on their menu. They offer so many different items for breakfast, lunch, dinner and dessert that I couldn't possibly fit it all into one post without leaving something out. Stay tuned for more on Giggles N' Hugs Topanga! Disclosure: I was not compensated for this post. 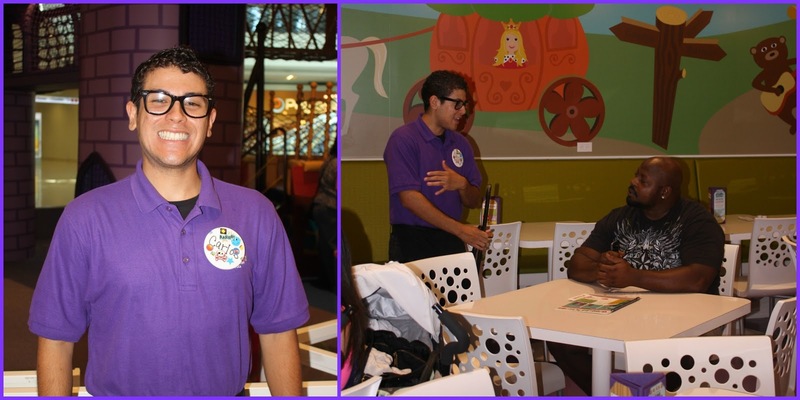 I was invited to visit the new Giggles N' Hugs in order to facilitate my review. These are just my two cents! I can't wait until Pumpkin is old enough to go there! I love that they have events like a bubbles guy or even Mickey Mouse. So awesome to see pics of the setup!